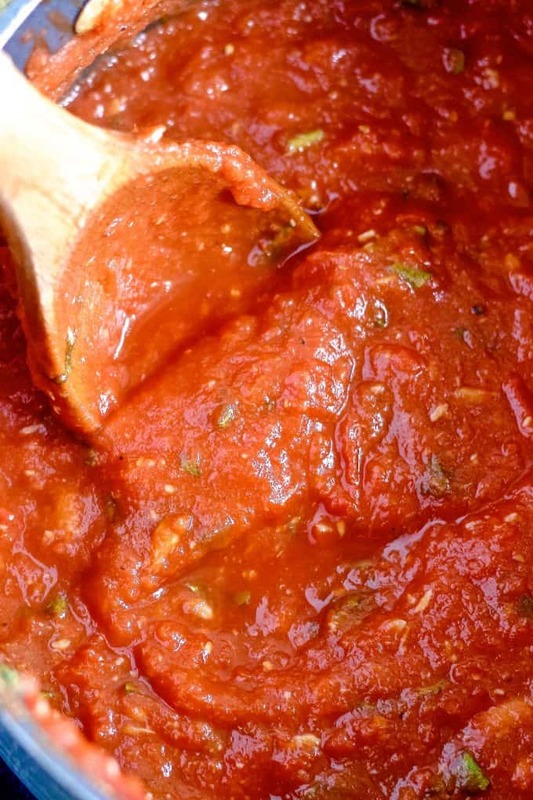 Try my easy basil roasted garlic tomato sauce today. 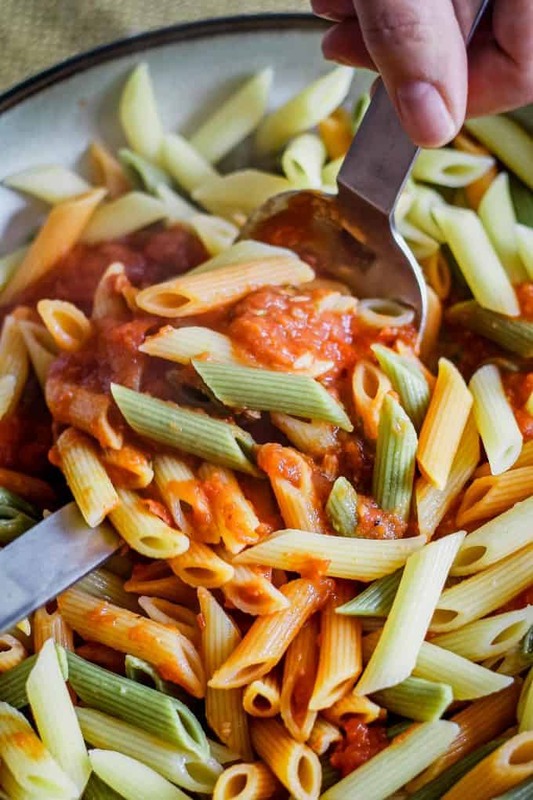 This pasta sauce is thick and full of garlic and fresh basil. 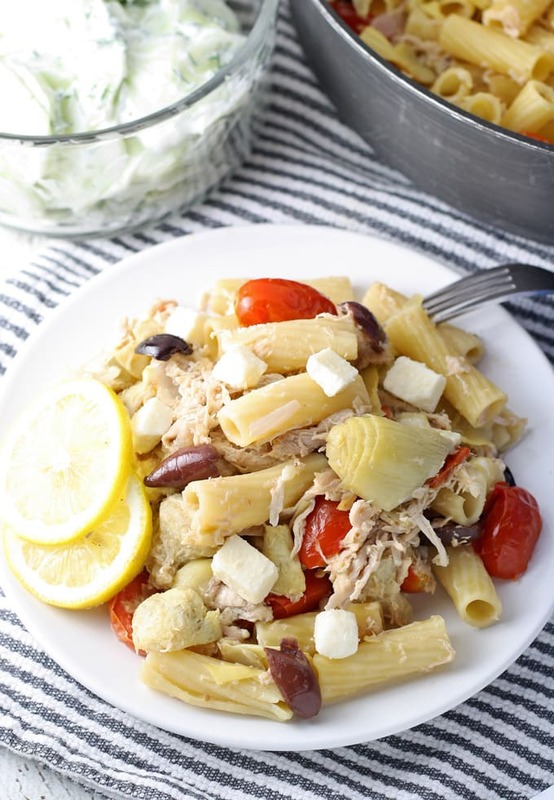 Serve it with your favorite pasta! Last summer I was taking some photos at a local restaurant and one of the items was a roasted garlic dish. It smelled heavenly. Usually, when I am offered the food after I am finished photographing, I pass. That day however, I said “Yes Please!” to the garlic dip and ate the whole thing. I think a server or two were peering over my shoulder, hoping I would share… and I just couldn’t. I love garlic. I needed to eat it all. As I headed home, hanging my head in shame because of my bad-sharing manners, I vowed to roast more garlic at home. Unrelated, but that same summer I planted some herbs in my yard. I have a black thumb but have lots and lots of luck with basil. Seriously, this is a photo of a just a 1/4 of the basil harvested from my basil plant. I don’t know what it is. Maybe it’s because I pick it often so it always has a chance to regrow. Maybe the spot the pot is in happens to be a magic basil spot, with just the right amount of sun and the opportunity to get just the right amount of rain. Last year, I made pesto. This year, we make pasta sauce. When you add a love of roasted garlic to a green thumb for basil, you sometimes end up with a fantastic and easy pasta sauce. As I was roasting the heads of garlic, I had flashbacks to taking those photos because Oh Man the smell! Maybe that’s what I like so much – not the garlic itself, but the smell? Nah, it’s the garlic which includes the smell. 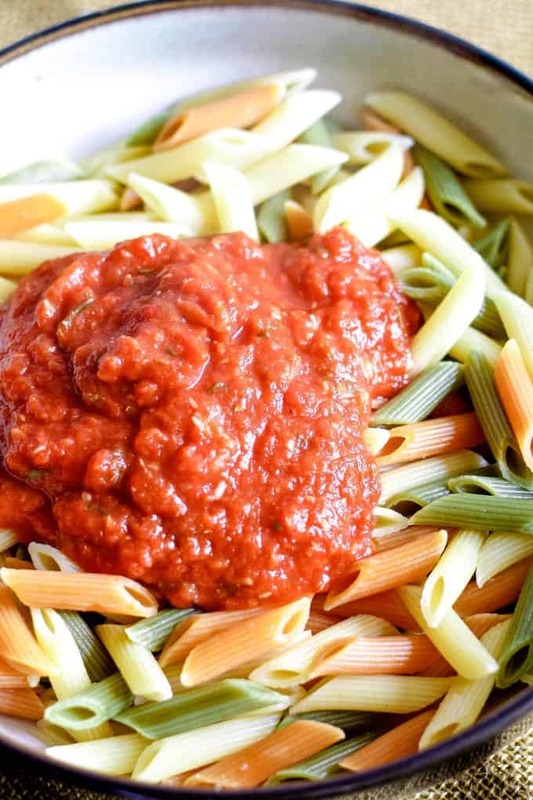 This easy roasted garlic basil pasta sauce can be made quickly, which is awesome. I pulled this recipe out of my bag of tricks this week because I had limited groceries and I wanted something with maximum flavor. The hardest part about this is roasting the garlic – it takes a little bit of time in the oven but I like to use that time to do some of those “other things” on my to-do list. Once that oven timer goes off, I start gathering up all of the other ingredients to this recipe and I get cooking. 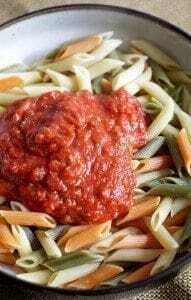 Many store-bought pasta sauces include sugar which I think is to cut some of the acid. Many moons ago, on some cooking show or another I saw the chef cut their sauce’s acidity with honey and that has been my trick ever since. Love me some honey. If three heads of garlic seem like too many for you, don’t be afraid to cut it to two. It will still taste great but the basil may overpower the sauce. So much goodness in every bite either way. Can you freeze pasta sauce? You can freeze pasta sauce for up to 6 months. 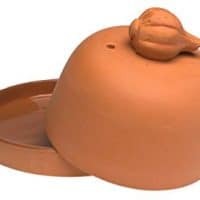 Let it cool completely and then transfer it to freezer safe bags or containers. 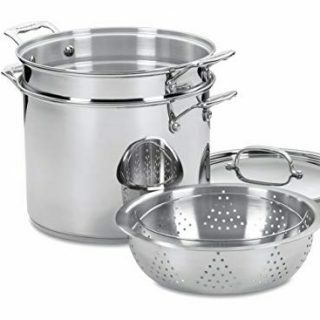 To defrost frozen pasta sauce, place the sealed bag or container in a bowl of warm water until the sauce has been brought to room temperature. 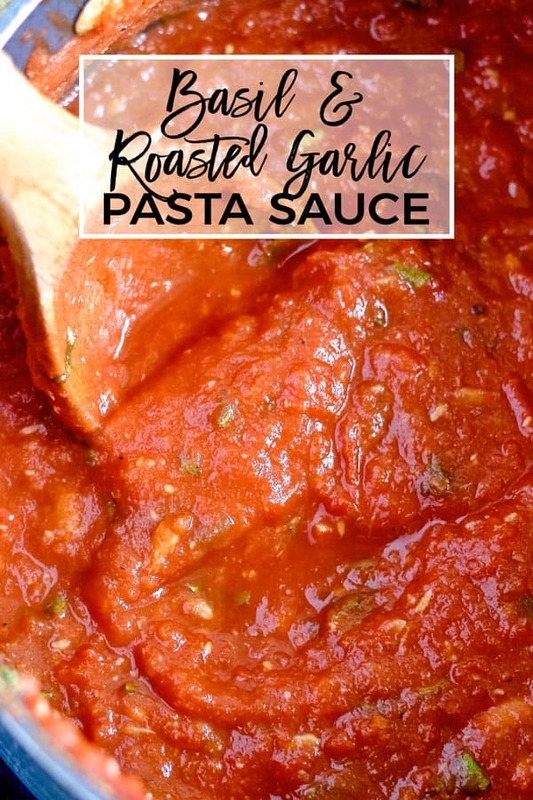 Try my easy roasted garlic basil pasta sauce today. It's thick and full of garlic and fresh basil. 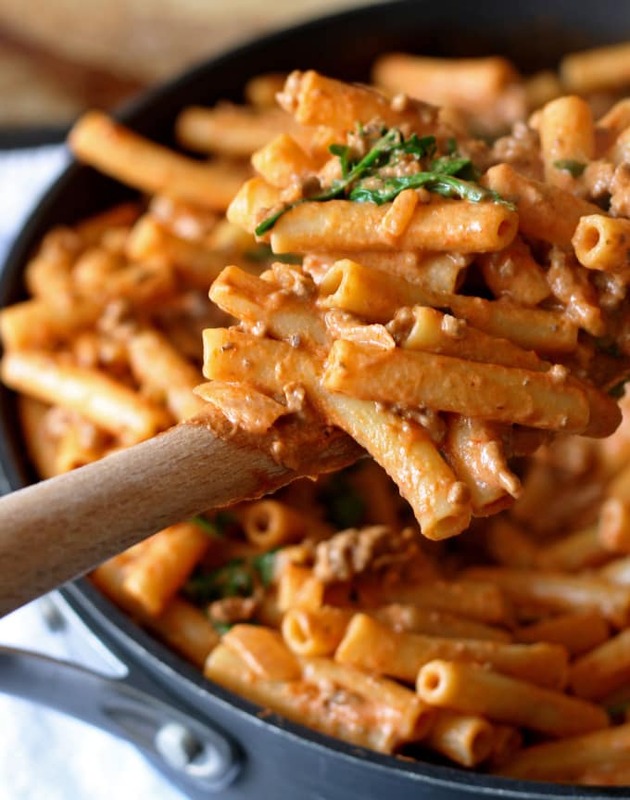 Serve it with your favorite pasta! Pre-heat oven to 400 degrees F. Using a sharp knife, cut off the top of each head of garlic so the cloves are exposed. Drizzle 2 teaspoons of olive oil over each garlic head, then wrap the garlic in foil. Roast for 35-40 minutes, or until the garlic cloves are tender. Remove from oven and let cool. When cool, use a spoon to remove the roasted garlic and crush in a small bowl. In a medium saucepan, combine all of the ingredients. Stir well. Bring to a boil, then reduce to a simmer. Simmer for 20 minutes, stirring often. Adjust salt and pepper to taste. Originally published May 2015, updated March 2019. I have a lot of basil growing in my garden so I will definitely be trying this! I remember the first time I saw my Italian neighbor add sugar to their sauce, when I was a kid. I thought it was the weirdest thing, and her sauce was SO GOOD. ha! I learned that trick early on! 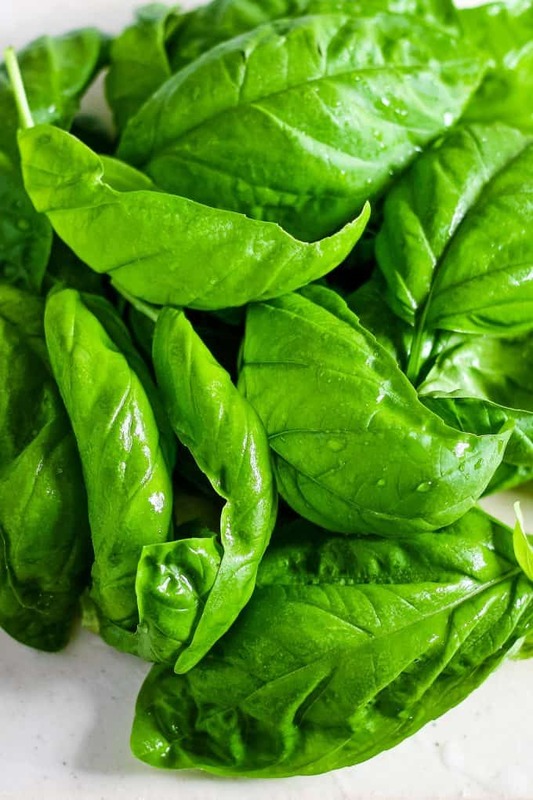 garlic and basil are two of my favorites – this sounds so good! Lol, my husband thought it was very strange the first time too! LOVE that picture of the garlic! And now I need to go roast some so I can make this yummy sauce! Looks amazing! 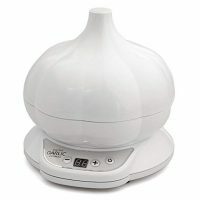 I am totally going to try garlic and celery next time I get a garlic craving! 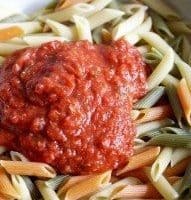 Love how easy this pasta sauce recipe is! Cannot wait to make this, roasted garlic is my favorite! Great idea. Thank you Dini – love your party! 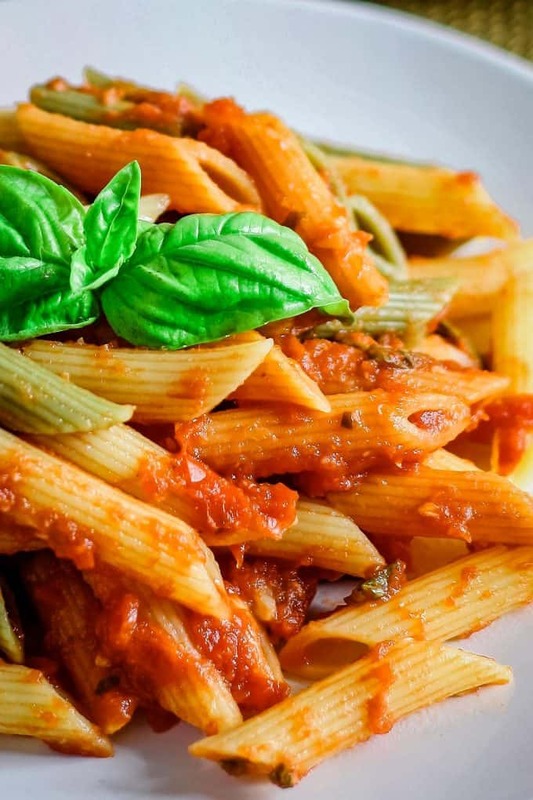 This roasted garlic basil pasta sauce sounds fantastic. I love your pictures, although they made me hungry. Yum! Thank you so much Dawn!! You just made my day! This looks incredible! I also adore roasted garlic! Oh my goodness this pasta sauce sounds amazing. I love roasted garlic and have lots of fresh Basil in our herb garden so this is a sauce I need to make us asap! I found you through the link party and am so glad that I did!! Can this sauce be frozen. Hi Jackie! I have frozen it before in small batches, with freezer bags. You can only eat so much sauce at once, right? I recommend finely dicing the basil if you plan to freeze the sauce. YUM! 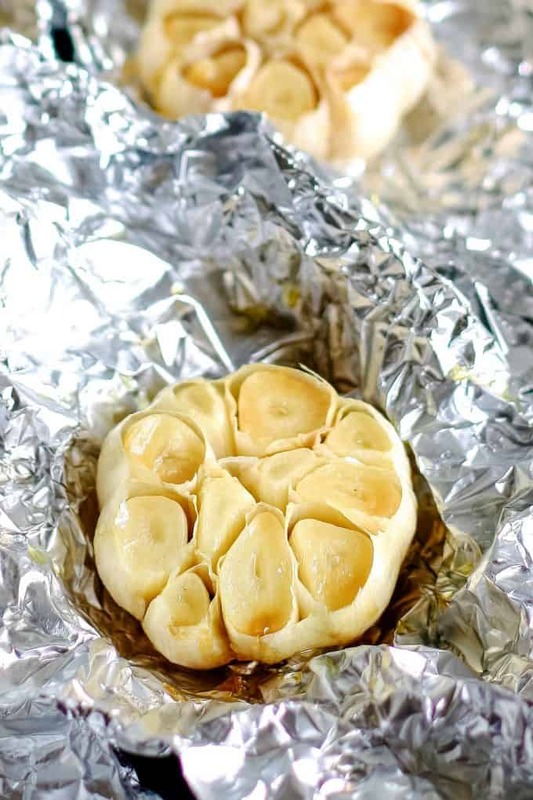 We love roasted garlic in our house – this looks so good! Yum! I love roasted garlic and this sounds so fresh and delish! Thanks for sharing this with us on Throwback Thursday!